Carpet is like any other material that can slowly break down and become weaker as time goes by. Although high-quality carpet is built to maintain its shape and stability, even the more expensive brands can show some signs of wear and tear after a while. When that happens, the carpet can start to wrinkle, buckle, and ripple. Your installer utilized a number of techniques and equipment to ensure that your carpet is laid taut across the floor. But sometimes the carpet can fall victim to the various effects around the home that could contribute to obvious wrinkling. Some of these are more likely than others to have an impact on your carpet’s well-being. Humid climates can have a significant effect on your carpet rippling up from the floor. The moisture in the air can get in and under the surface and cause subtle wrinkling at first, and the more foot traffic it gets, the worse the condition can get. Improper padding is also a cause of wrinkling. If you have cheap padding installed underneath, that could be detrimental to the look and condition of your carpet over time. Heavy objects can also contribute to the wrinkling of your carpet. Moving furniture and other items with tremendous weight need to be lifted and not dragged across the carpet as doing so could cause rippling and buckling. Lastly, sometimes a poor installation job is the reason why your carpet is starting to come up from the floor. Stretching is a primary component of carpet installation and if the contractor doesn’t perform the job correctly, wrinkling can begin to take place sooner than later. Whatever the reason might be, if you don’t remove carpet wrinkles at the first sign of a problem it is only going to continue to get worse. But what are the best ways to go about doing just that? This local carpet cleaner is here to help you out. Here are some helpful tips for fixing the problem on your own. If you’re going to fix the problem, you need to know what you’re dealing with first. Regardless of why the carpet is starting to wrinkle, repairs can only be made once you understand how it was installed in the first place. When your carpet was laid down, tack strips were positioned at each end of the room to hold the carpet in place. These are supposed to prevent it from sliding around on the floor and your first course of action is going to be to detach the material from these strips. You can’t very well fix the wrinkles in the carpet when there are items still sitting on it. So you need to take everything out of the room before you can get to work. Furniture, lamps, plants, anything that is positioned on the carpet needs to go. You might even want to take out everything not positioned on it either, which might give you more room to work. When you’re done, you should also vacuum your carpet entirely. Cleaning the carpet will get out all of the dirt, hair, and dust that’s in there and having an empty carpet without furnishings on it allows you to clean every square inch. Slowly but firmly, detach the edges of the carpet from the tack strips underneath. Don’t do this with all of the sides. Keep one remaining in place on its strip. Which one you select is up to you. You’ll need this side stuck in place to allow for effective stretching of the material. On the sides that you do remove, inspect each of the tack strips for damage to make sure that your repair job won’t be compromised by an ineffective strip. If a strip is damaged, you will need to replace it. Now that your strips are in good shape, lay the carpet edge back over its corresponding strip. Be sure to press the carpet tightly into the space where the wall and the strip meet. This is wall to wall carpeting you’re trying to fix; you don’t want any gaps visible between the edge of the carpet and the wall. 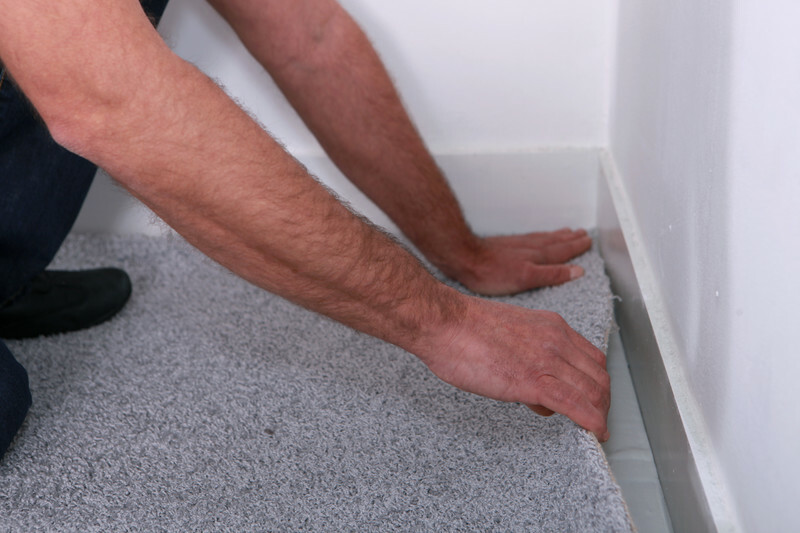 You will need to get a stretching machine for this step and when you operate it, be sure the carpet is taut and tight before you’re finished. Inspect closely for any indications of wrinkles and if you still find some, you can try applying heat to these areas. A hair dryer or some other portable heat source should do the trick. Restretch the carpet once again to ensure that all of the wrinkles are eliminated entirely.